Each year, the Board of Directors of the Simi Valley Education Foundation honors the memory of Lew Roth, the founder of the Simi Valley Education Foundation. In his honor, the community, students, parents, certificated and classified staff, are asked to nominate worthy individuals for a Lew Roth Award. Recipients must work or volunteer within the Simi Valley Unified School District. Many dedicated individuals make a real difference in our schools and in the opportunities for children. It may be obvious dedication to the schools and students, or it may be quiet, but positive influence on students who need extra support or attention. 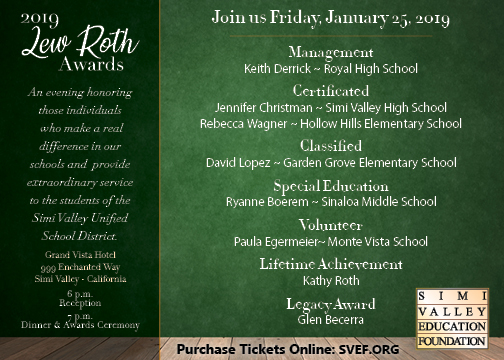 We are happy to honor and recognize the individuals above for their extraordinary service to the students of the Simi Valley Unified School District at this year’s Lew Roth Awards Dinner on Friday, January 25, 2019 at the Grand Vista Hotel, Simi Valley. Notice: By supplying my contact information, I authorize The Simi Valley Education Foundation to contact me via email, and/or postal mail about its programs, events and services. For one courtesy Opportunity Drawing ticket please call 877-SIMI-KID. Principals, Assistant Principals, Counselors, School Psychologists, District Administrators, etc. Teachers, Nurses, Speech Therapists, etc. Accounting, Clerical/Secretarial, Custodial/Maintenance, Food Service, Instructional Aides, Playground Supervisors, Purchasing/Warehouse, Transportation, etc.